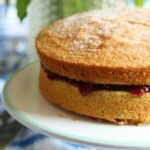 Gluten Free Victoria Sponge (Dairy Free Option) | The Free From Fairy. 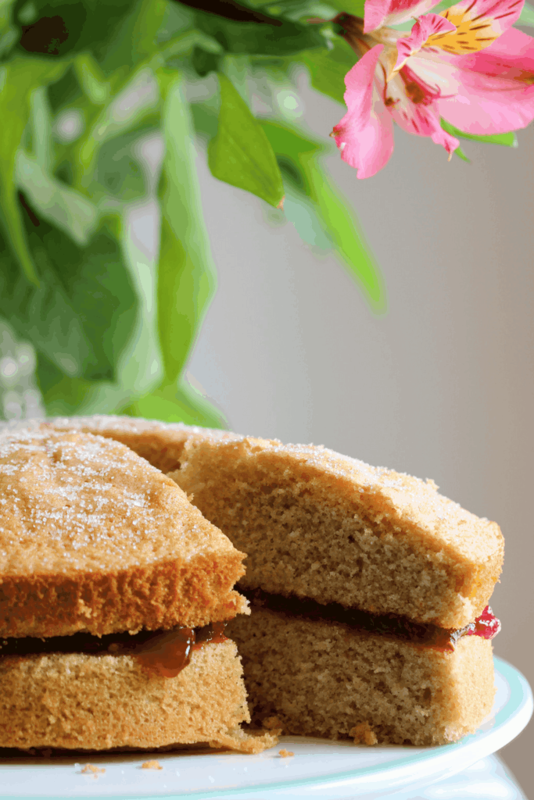 My recipe for perfect gluten free Victoria sponge cake never lets anyone down. It’s very easy to make and tastes divine. The mixture can also be used to make other gluten and dairy free cake by adding other flavours. This time suggesting that those following it potentially miss out on the protective affect on the heart that whole grains have. The large study was carried out over a long time period in the USA and was reported in the British Medical Journal. The study concluded that “avoidance of gluten may result in reduced consumption of beneficial whole grains, which may affect cardiovascular risk. Once again, it is assuming that everyone on a gluten-free diet eats highly processed products. However, there are lots of gluten free whole grains to chose from. What gluten free whole grains are there? There are many wonderful gluten free whole grains. Examples include teff, quinoa, sorghum and buckwheat (to name a few). 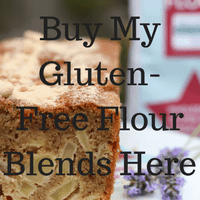 I have shown, through the development of my flour blends, that cooking and baking with wholegrain gluten free flours is easy. Therefore this advice would seem ridiculous. Rather than tell people to avoid the gluten free diet, they should be advising people to eat the fabulous gluten free whole grains that exist. Anyway, off my soap box and on to my recipe. 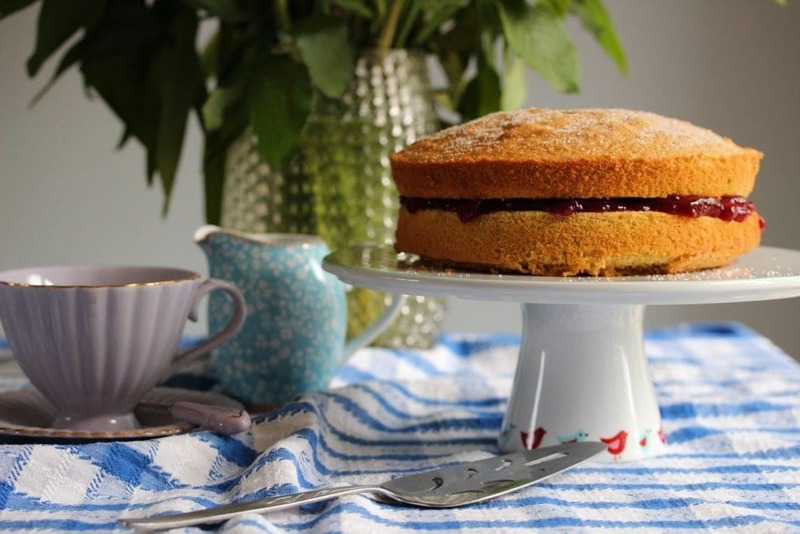 Gluten free Victoria sponge is a recipe that has been requested so many times I’ve lost count. It’s so simple I’ve never shared it, despite making it all the time. 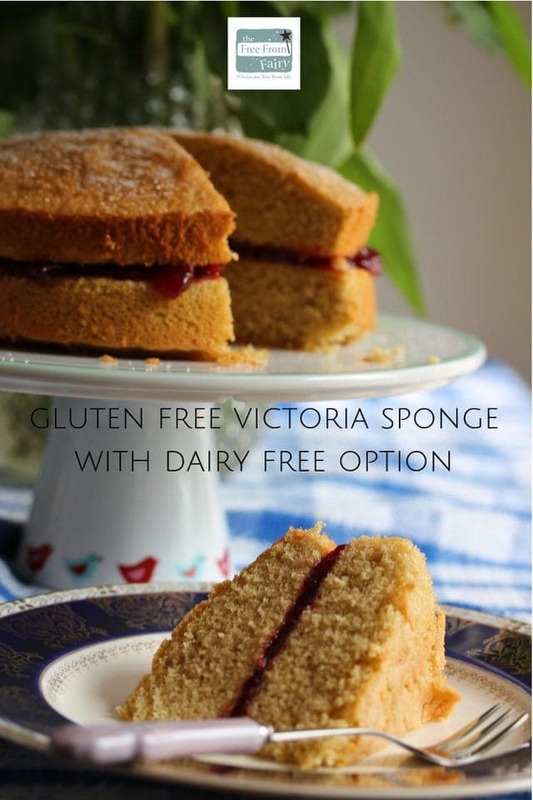 I use it as the basis of most of my gluten free dairy free sponge cakes, flavoured whatever way I like. I made it live on Facebook yesterday. It was all a little chaotic but it shows how easy it is to make if you need that little extra push to do it. At least by making gluten free Victoria sponge cake with my wholegrain flour you can have your cake and eat it. Bake in the pre-heated oven for 15-25 minutes depending on your oven. When it's done it will be soft to the touch but not sloppy! Nutrition facts are for guidance only. Hi. May I ask why white sugar not an unrefined sugar? I’ve noticed a few recipes lately stated white sugar. Does it make a difference? Hi there, I just mean bog standard white sugar…you can use unrefined it’s just more expensive and frankly sugar is sugar whatever form you eat it in! I suspect, Kate, that it will be way better. You are the queen of cakes and I’ve never seen a non-fabulous one on your site! Ah thanks Julie, that’s really kind! 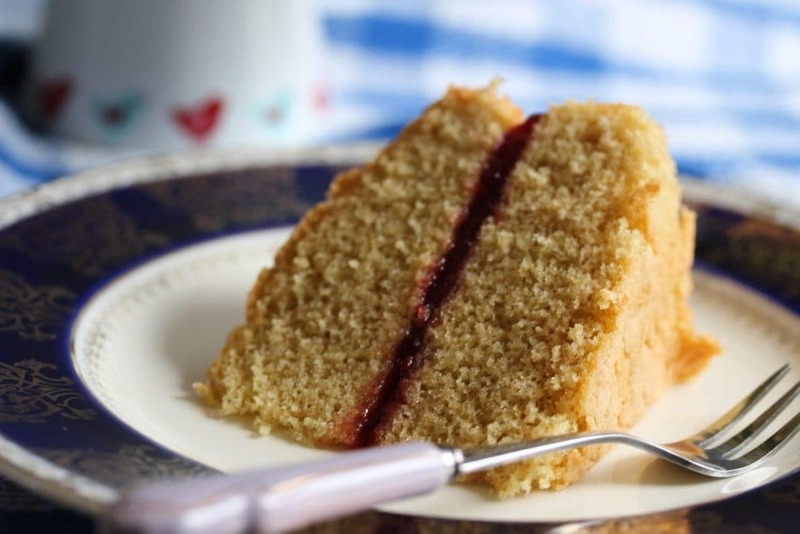 Do you have an egg free victoria sponge recipe, as this is what I thought this one was going to be, when I first read my email. Hi Anyonita, thanks for your lovely comment! 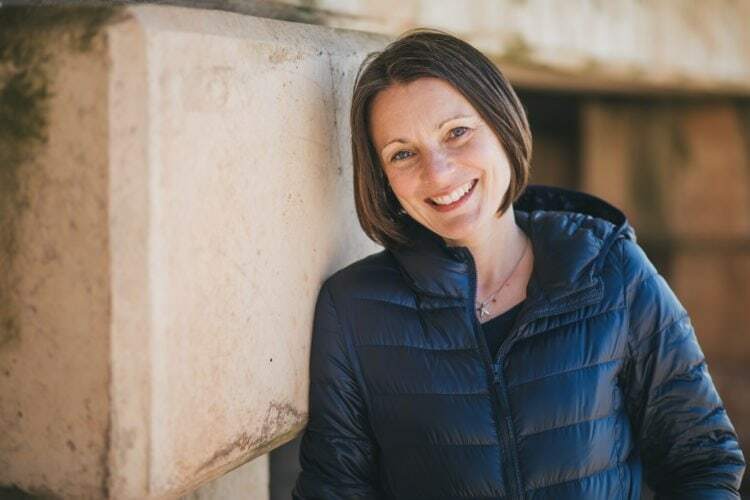 A couple of my blogging friends also run a linkup with the same name?!! Anyway, love your site…it looks fab! Ah that’s brilliant…well not that you have children with restricted diets in the family but you know what I mean! Let me know how it goes. Hello again Vicki ! Have made this beautiful cake a number of times now , with your flour of course , but find the outer layer / crust often breaks away or comes off after baking . The cakes itself is gorgeous and always gets eaten but wish I could prevents the crumbling off of the outside layer … any ideas ?? All the ingredients are the same except for using golden unrefined sugar . Perfect otherwise !! Mmm Nicky I’m not sure. Are you greasing the tin well enough?? 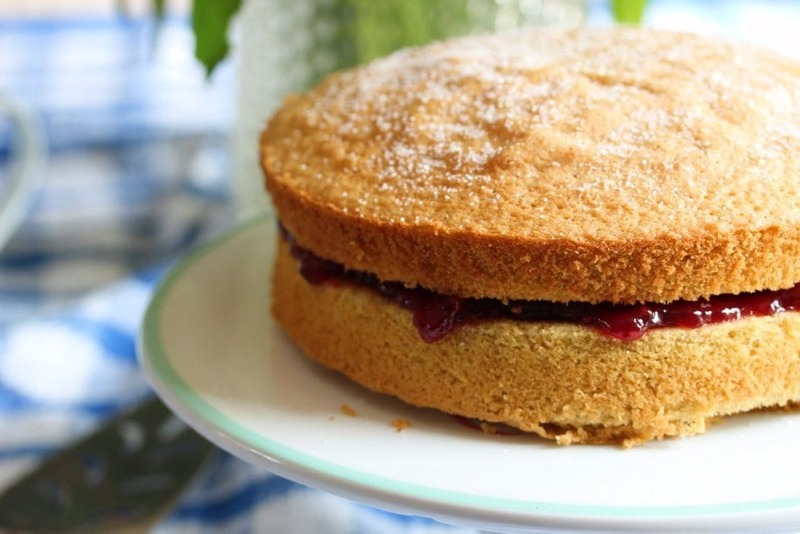 Hi Vicki I have just made a victoria sponge using your sr flour all went well until I took it out of the oven and took it out of the tins but it appeared to be very crusty and it was very dry and crumbley although it tasted very good i couldn’t cut slices as it fell to pieces.Please can you help? Hi Sue, I replied to your comment on the post about gluten-free flours…let me know what you did. Hi Vicki, my Granddaughter can’t have eggs. Will this recipe work ok with egg substitute? Hi Linda, sorry to hear about your grand daughter. I think the recipe would be fine with egg substitute. You may want to add a 1/2 tsp of baking powder to help with the rise. Let me know know you get on! Hi Harriet, I haven’t tried the recipe with Doves but you should be fine. Buy their self-raising and perhaps add a little more liquid in the form of dairy free milk. Good luck! Hi. Does your flour contain xanthum gum as I can’t tolerate it? Thanks. Hi Maz, so sorry for my late reply…I missed your comment. No, it doesn’t contain anything except flour (and raising agents in the self raising). Made your Victoria Sponge Cake using your own Self Raising Flour and it came out beautifully light and well risen. Very easy to make with my Kenwood Mixer and very easy to eat.